I hope all of you are enjoying this up and down weather that we are having. I hope that by the time you read this, the weather decides to stay nice and warm. Hopefully, not too warm. I am looking forward to seeing the entries for the “Big E” contest, a collage of pictures with a theme on an 8.5” x 11” piece of paper. It can be pictures from a magazine or photos or some of each. The theme can be anything you desire. Please let us know what the theme is so that we can judge them properly. 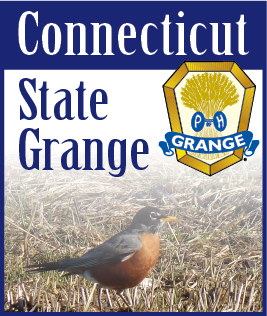 These will be judged on June 7, Grange Sunday at Goodwill Grange Hall. Remember that the Drawing Contest and the Creative Writing Contest will be due at “Let’s Celebrate” on July 25th. This will be held at Good Will Grange Hall also. The themes are “Your Favorite Place Outside.” I am having this contest earlier this year so that I can send all the entries on to National to be judged there. Did you see Senexet Grange Hall as the mystery grange in last months Granger. That’s my Grange. Have a wonderful summer. See you in the fall.